Five Star Service, at Three Star Rates. 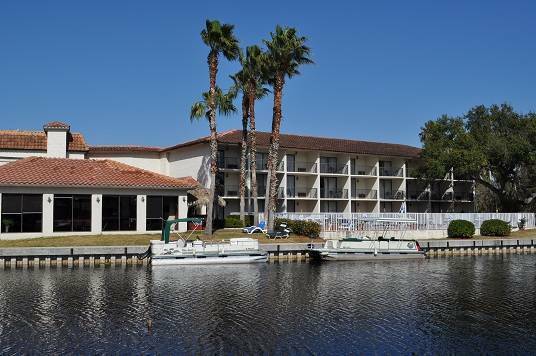 Lake Tarpon Resort is a Beautiful, Waterfront, Mediterranean Style Hotel, nestled quaintly around our Boat Basin, which adjoins Lake Tarpon and just minutes from Florida’s Gulf Beaches. Lake Tarpon is a 2500 acre (10 Km) Sports & Recreation Lake, known for its Bass Fishing. 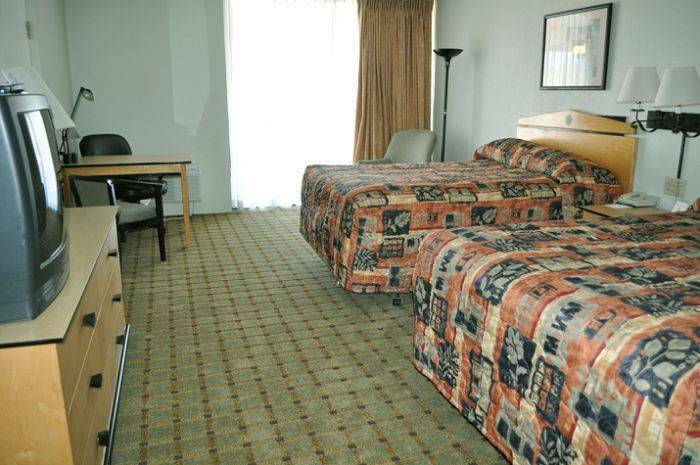 All of our Spacious Rooms have a Beautiful Waterfront View of our Boat Basin. Our rooms consist of Standard Rooms with 2 double beds or 1 king size bed, 2 & 3 room Suites are also available, as well as, Jacuzzi Suites. Relax around the Pool, Hot Tub or Tiki Bar, after a fun filled day of Fishing, Boating, Golfing, Sunning or Sight Seeing. (Fishing Pole & Pontoon Boat Rentals Available) Later spend the evening, in Dockside Sports Bar & Grille, enjoying Waterfront Dining, Live Entertainment or watch your favorite sport, on one of 25 Big Screen Televisions. When the day is done you will sleep peacefully, in a bed so comfortable you will want to take it home with you. We are confident you will return again and again, to enjoy the pleasure and comfort of our hotel. We are located across from Innisbrook Golf Course & Spa, just minutes from the Historic Tarpon Springs Sponge Docks & Gulf Beaches. Meeting Rooms, Banquet Rooms and Catering also available. 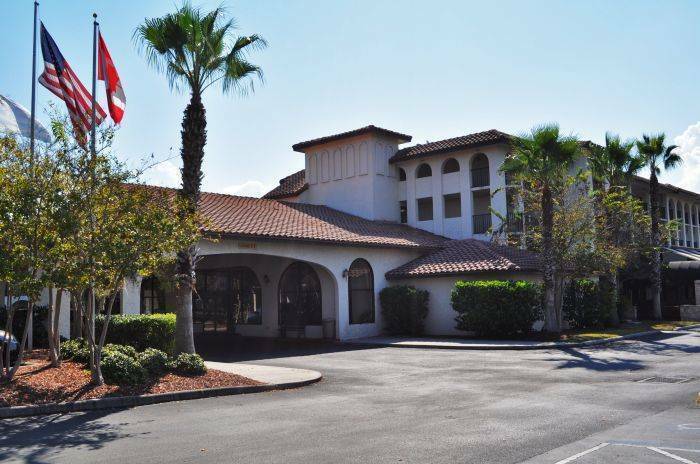 We are located on Beautiful Lake Tarpon, across from Innisbrook Golf Course & Spa, as well as minutes from Fox Hollow, Tampa Palms and East Lake Woodlands. We are just around the corner from the Historic Tarpon Springs Sponge Docks and the Gulf Beaches, including world-renowned Clearwater Beach, with its Pristine White Sands & Robust Nightlife. Area attractions include: World Famous Busch Gardens, the botanical paradise Sunken Gardens, Salvador Dali Museum, Ringling Museum, Mosi the Museum of Science & Industry, Leepa Ratner Museum of Art, famous Lawry Park Zoo, the Chimp Farm and of course the Florida Aquarium. Other activities include: Deep Sea Fishing & Fishing Charters, Scuba Driving, Boating, Fine Dining, Casino Boats, Starlite Dinner Cruises, Theater at Ruth Eckerd Hall & the Oscillo Theater. For the Sports Fans we have the Tampa Bay Buccaneers and of course the Tampa Bay Rays & Lightning. We are also the Spring Training Home of the Philadelphia Phillies, Toronto Blue Jays and the New York Yankees. As we are centrally located between all of the fields, fans and players alike, for all sports, enjoy our location. Dockside Bar & Grille is our onsite Restaurant & Bar providing Fun, Food & Spirits seven nights a week; Live Entertainment most nights. Whether you want to enjoy your favorite sport on one of our 24 Big Screen TV’s or want to relax and enjoy quiet conversation on the Patio, at the Tiki Bar poolside or in a side room to yourself, our staff will accommodate. The Cuisine will delight you, the Spirits will bite you. the Atmosphere and Entertainment will enlighten you. For those that wish to enjoy a quiet night in, Room Service is available. Meeting Facilities are available to accommodate almost any size meeting, gathering or event. We have everything from Conference Rooms to Banquet Halls at your disposal. The Goya Room is a fully furnished Corporate Style Conference Room, with seating for up to 10 comfortably. Ideal for Conference Calls, Corporate Meetings, Sales Meetings, Presentations, Dictations. Anytime Professionalism is the Standard, not the Goal. The Dali Room is a Seminar Style Meeting Facility. It accommodates seating for approximately 30 to 35 comfortably, with a speaker podium and presentation screen at the front of the room. The Dali Room is perfect for Seminars, Larger Sales Presentations, Training Classes or Workshops. Our Banquet Facilities inside Dockside Bar & Grille, with its spacious floor plan sectioned rooms and water views; can accommodate any event from Banquets to Weddings. Our Catering Staff is able to assist you with: Scheduling & Production, Planning of your Menu, Decoration, Entertainment, ETC… We are at your service and Guarantee an Event to Remember. Our Business Center can provide you with: Wireless and High Speed Internet Access, Computer with Business Software, Photo Copier, Facsimile Machine, Scanner, Overhead Projector & Sound Equipment. Catering Services are available for all of our conference and meeting facilities. We serve the Greater Tampa Bay Area, we are just across Tampa Bay, in Northern Pinellas County. We are approximately 10 miles north of Clearwater, at the Palm Harbor & Tarpon Springs Border. 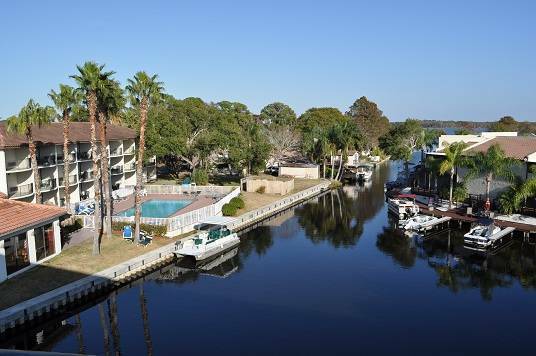 In addition to have spacious rooms with balconies or patios, the hotelhas docking facilities for your boat. We also have Boat Rentals, a Putting Green, a Poolside Tiki Bar & Fitness Center. For the Business Traveler our Business Center is available 24 hours a day. We have Conference Rooms, Meeting Rooms and Banquet Facilities. The Deluxe Double has a spacious floor plan with 2 Double Beds, featuring Pillow Top Mattresses, for a comfortable nights sleep. Individually controlled air conditioning units insure climate control comfort. Remote Control Television allow you to relax while watching your favorite program or movie. All together providing our guests with the comforts of home. 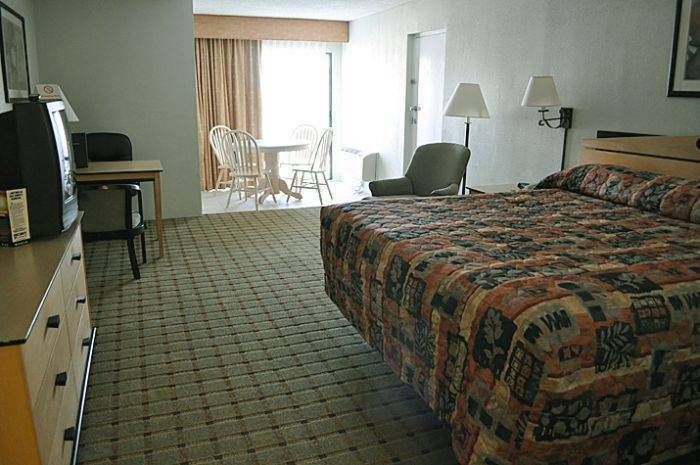 The Deluxe King has a spacious floor plan with a King Size Beds, featuring a Pillow Top Mattress, for a comfortable nights sleep with plenty of room to roll around. Individually controlled air conditioning units insure climate control comfort. Remote Control Television allow you to relax while watching your favorite program or movie. All together providing our guests with the comforts of home. Our onsite Restaurant & Bar providing Fun, Food & Spirits seven nights a week; Live Entertainment most nights. Whether you want to enjoy your favorite sport on one of our 24 Big Screen TV’s or want to relax and enjoy quiet conversation on the Patio. Open on Saturday & Sunday, providing fun food & spirits poolside. Great food, good prices and ridiculous portions. Love the Flaming Cheese, Gyros, mountainous Greek salad and Greek Chow Mein. And who can say no to Baklava? Plan on asking for a doggy bag because you'll never be able to finish. A fun place to eat and drink. They have Great Prime Rib, Sirloin Steak, Sweet Potatos or Real Baked Potatos (not nuked), and the all you can eat Salad that comes with it. Of course we love eating the peanuts and throwing them on the floor. Pauls is a must visit when we are in the area. This is a casual but nice seafood place that is definately worth visiting. The place is decorated with fishing nets and sponges and other fishing motiffs including a large fish tank that the kids enjoy. It sits right on the Tarpon Bayou and has their own crabbing boat. Which is how you know it's fresh. It also really adds to the ambiance when you are eating and you see the boat pull up, subsequent unloading of siblings of the crabs you just dispatched. Double Occupancy, $10 each additional person, $15 per pet, up to 45 Lbs, per night. Payment in full at time of stay. Cancellation must be receive, in writing, by 4:00 PM EST. day of arrival or a cancellation fee of 1 nights rate will be charged. Public Bus routes are in the front of the hotel, Taxi Cabs are available on request, Automobile Rental will deliver to the hotel. 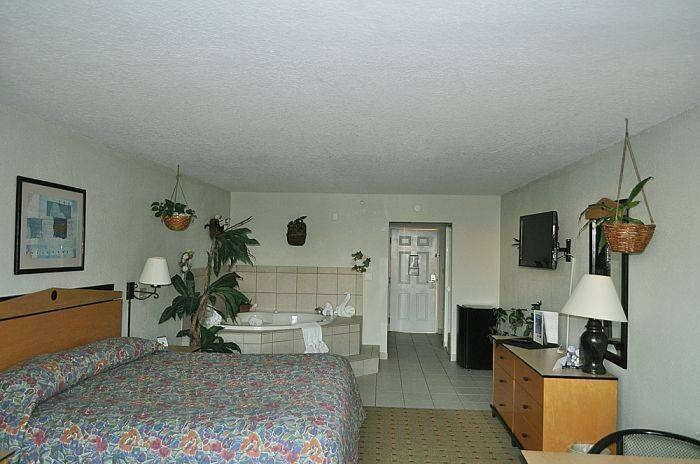 Nearest airport: Tampa International Airport is aproximately 22 miles from the hotel. Shuttle Service is available at a cost of approximately $22 USD.